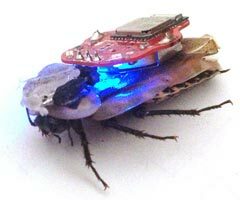 RoboRoach is is the world’s first commercially available cyborg. Cockroaches use the antennas on their head to navigate the world around them. When these antennas touch a wall, the cockroach turns away from the wall. The antenna of a cockroach contains neurons that are sensitive to touch and smell. These neurons convey information back to the brain using electricity in the form of spikes. 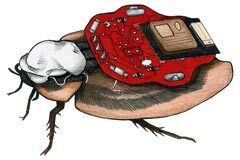 To control cockroaches, microstimulation (neurotechnology) can be used by sending small electrical pulses directly to the neurons of the cockroach antennas via a backpack. A learning kit, called RoboReach kit, has been created by neuroscientists, engineers and educators of the University of Michigan. The cockroach undergoes a short surgery in which wires are placed inside the antenna. Once the insect recovers, a backpack is temporarily placed on its back. Tim Marzullo and Greg Gage of the University of Michigan founded Backyard Brains, a small company that makes neuroscience educational equipment and experiments for students of all ages. Backyard Brains terminated succesfully in July 2013 a Kickstarter campaign to support the RoboRoach Kit. Of course, there are underlying ethical questions attached to such experimentation involving living things. People don’t always recognize insects as valuable life forms, but some critics are already speaking out against RoboRoach. Animal rights group PETA has spoken of the project as retrogressive and morally dubious. In defence of the cockroach: RoboRoach Kickstarter ignores ethics is the title of a contribution posted by Liat Clark in wired.co.uk. Our experiments are not philosophically perfect and without controversy; however, we believe the benefits outweigh the cost due to the inaccessibility of neuroscience in our current age. Backyard Brains sells other products in their online shop : Spikerbox, EMG Spikerbox, Completo, 3D manipulator, RoachScope. This entry was posted in Science & Philosophy and tagged robot by Marco Barnig. Bookmark the permalink.